Southern Illinois University Edwardsville Interim Provost and Vice Chancellor for Academic Affairs Denise Cobb today named Timothy Schoenecker, PhD, as interim dean of the School of Business. Schoenecker has agreed to serve for a period of two years to accommodate other leadership changes within the University and retains the option to be a candidate for the permanent position. The appointment is contingent upon SIU Board of Trustees approval. An associate professor of management and marketing in the School, Schoenecker takes the leadership reins Friday, July 1 from John Navin, PhD, who resigned to assume the same duties at Ohio Northern University. Navin has led the SIUE School of Business since 2013. “Dr. Schoenecker’s experience will be vitally important for the School of Business and the University during this interim period,” Cobb said. “His collaborative approach will assist the School as it works to address the fiscal challenges and achieve its goals. The interim dean will also work with the leadership team, faculty and staff to continue preparations for the upcoming AACSB (Association to Advance Collegiate Schools of Business) accreditation review. Schoenecker previously served as interim dean for the School in 2007 and 2008. He returned to full-time faculty duties in fall 2008 after 18 months of productive leadership. Prior to that role, he served as associate dean for academic affairs for more than four years. He has provided leadership at the University level as chair of the University Planning and Budget Council and, most recently, as chair of the steering committee for the chancellor’s ad hoc University Congress. 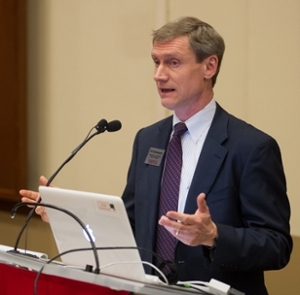 Cutline: SIUE School of Business Interim Dean Tim Schoenecker.